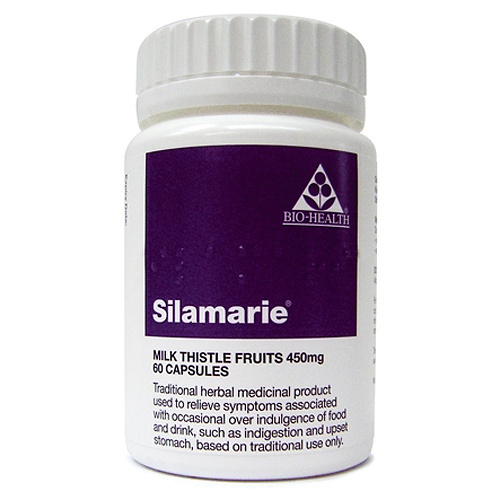 Silamarie Milk Thistle is a traditional herbal medicinal product used to relieve the symptoms associated with occasional over indulgence of food and drink, such as indigestion and upset stomach, based on traditional use only. Milk Thistle fruits (Silybum marianum L. Gaertner). Take 1 or 2 capsules 3 times daily swallowed with water up to a maximum of 6 capsules daily. If the condition worsens or symptoms persist, a doctor or a qualified healthcare practitioner should be consulted. This product is not recommended for children or adolescents under 18 years of age. 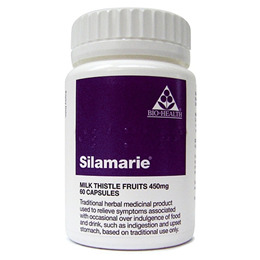 The safety of SILAMARIE during pregnancy and lactation has not been established. Due to the lack of sufficient data, use during pregnancy and lactation is not recommended. Below are reviews of Silamarie - Milk Thistle - 60 x 450mg Caps by bodykind customers. If you have tried this product we'd love to hear what you think so please leave a review. Excellent supplement, helps to detox the whole body.